I was recently inspired by a tweet where a Grade 4 class was asked what they would like to learn. On my weekends the inevitable question arose from my six year old daughter “Mummy, what can we do?”. For the first time in a while I had a well planned answer for her. She had asked recently twice what it is that I did as a job and I very loosely explained it but decided that this was the prime opportunity to kill three birds with one stone – give her a good understand of some of what I do, fill up an hour of her time and find out what she would like to learn. As an early concluding statement I was very happy with the results. 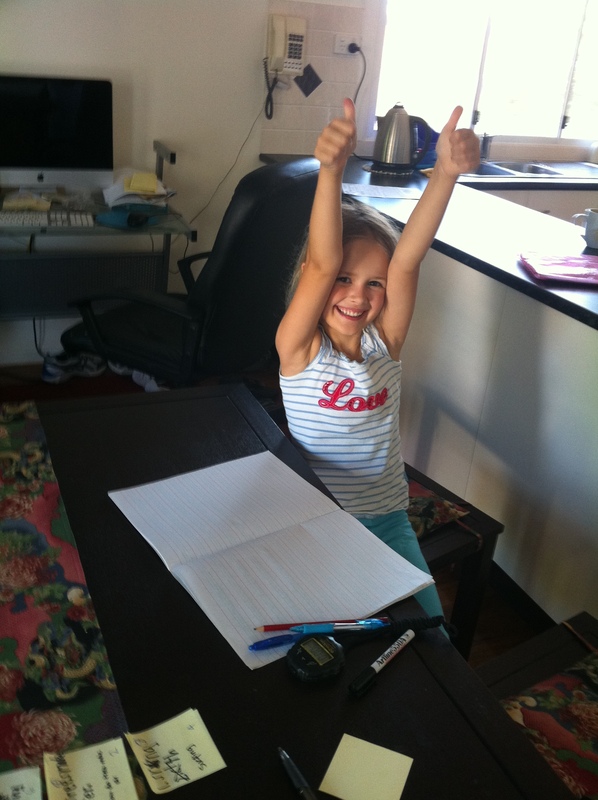 Gave her five minutes to brainstorm things that she wanted to learn. I framed this as either physical, practical or research (ie find out more about). 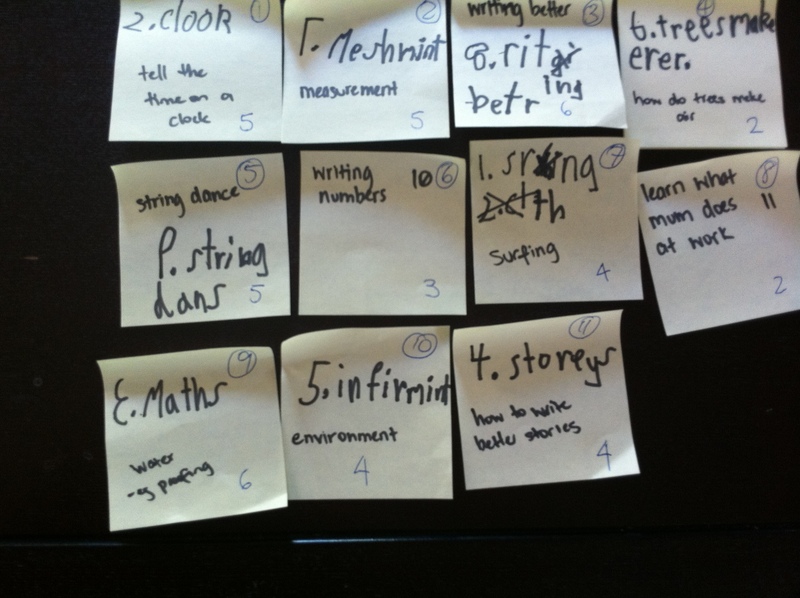 Because I wanted her to work on her writing I asked her to write them up one per post it note. I also added one card to cover what I do for a living, but the exercise itself covers off some of this. After that they were sized in minutes (shot B of the outcomes). I found this incredibly funny and really hard to restrain my opinion on how long they would take – I wanted to timebox myself to her times and not mine. I found it interesting where the item I added was in her priority. og, in progress and done. Then we began our hour. Before we started each card (ie before the timer started on it) we defined exactly what we wanted covered in it through a conversation. Once this was clear we moved the card into in progress which was a signal to start the timer. If we reached the end of the card’s estimated time I would ask the question if we were done against our criteria or if she wanted to spend more time on it. Only on one occassion did we reach the end of the timebox and she wanted to extend it. I then asked her what she wanted to de-scope and she chose what to remove from the backlog in order to extend that card’s time. In three instances we were shorter than the cards estimate, we probably could have pulled back in the one we cancelled because of this but her attention span was starting to wane at the 55 minute mark and I cut the one hour timebox off early. When the card was finished it was moved into done and any deviations to the actuals written down. So take a look at some of the other shots of work in progress and some of the outcomes. Lastly there is a mid sprint opinion on how the exercise was going. I think sprints and even the whole concept of Scrum and Agile are there to handle our inefficiency in time organization skills as adults. Kids don’t need that discipline, because they already have it. 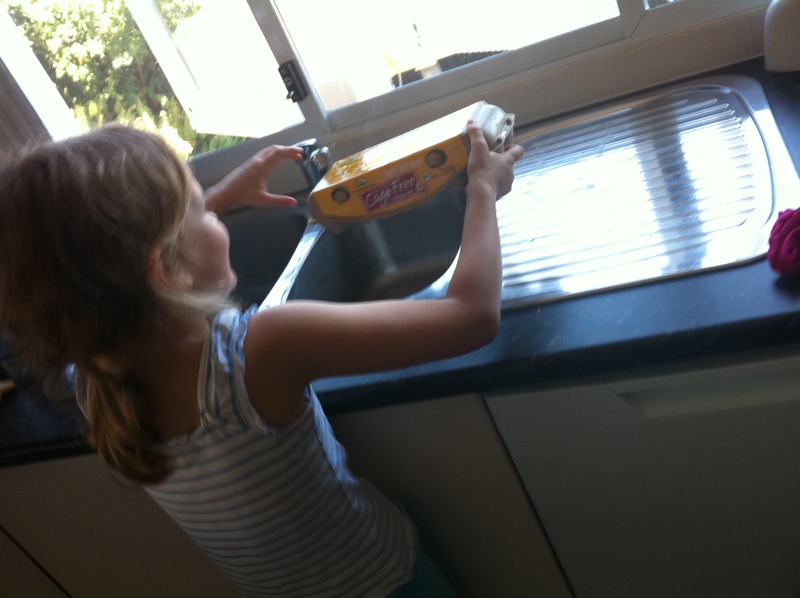 Kids are usually eager and motivated to do a job (outside of school, of course) that they always do it on time and according to specs. PS: I have published an article on teaching project management to students, I hope you’ll have a chance to read it. 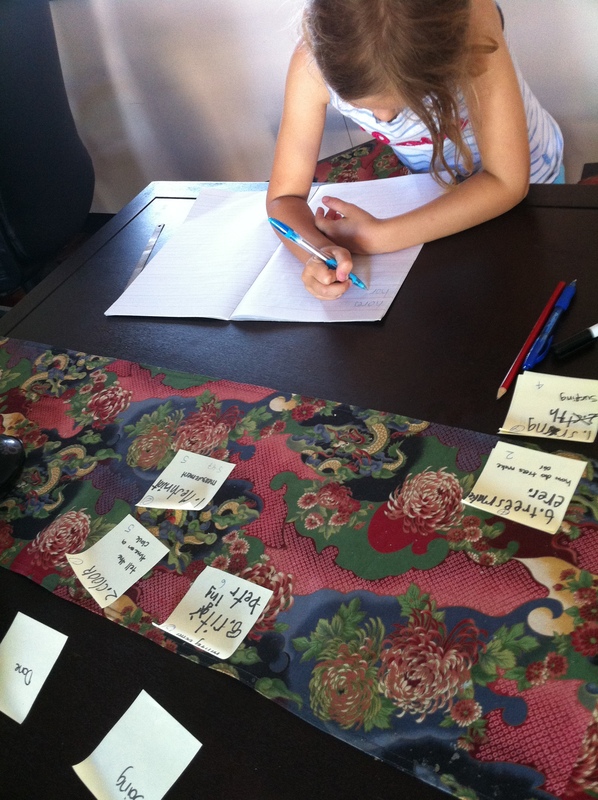 I’m curious – how exactly do kids have time organization skills? They cannot tell the time, they are distracted all the time – but if they are given an environment that they can focus in and something that is small enough then they can achieve it. How is this different from us as adults – don’t we need an environment that allows us to focus and work small enough to demonstrate progress? We are all motivated and eager to show progress. I would have thought adults were more optimistic but after seeing her estimates I tend to think otherwise now. She wouldn’t have done it on time 100% of the time had I not been strictly timing her. In the end was she confident that she understands what you do for work? ← Ken Schwaber’s Tweet – Hoax? Error? Hack? or Truth?